Butch Cassidy, Sundance Kid and Bill Carver rob a train and go to Mexico to start a legitimate business but a Pinkerton man trails them and Mexican bandits want the trio's capital. The three Hammett brothers are caught in a conflict that escalates rapidly and the old farmers facing against new farmers who have settled in the green grasslands. The Sundance Kid: I didn't want to kill him! I just wanted to put a bullet... just wanted to put a hole in him. Cursed By The Original, Better Than It Is Given A Chance To Be. Whenever I see anyone comment upon this little film, they immediately begin by blasting it because it cannot compare with the classic; "Butch Cassidy And The Sundance Kid." I personally do not see that this prequel film was trying to meet or exceed 'The Original' but rather, provide a fun addition and a playful homage to it. Stars Tom Berenger and William Katt do a credible job as young, fumbling and bumbling outlaws trying to hit their style and stride without getting killed in the process. No, they are not Paul Newman and Robert Redford, but they are not playing Butch and Sundance as seasoned vets at THE END of their criminal careers, either. 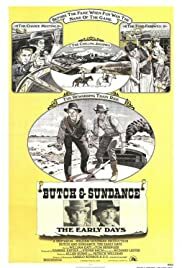 Watching this, I have no trouble accepting it as a humorous glimpse at the formative beginning and early misadventures of The Legends; Butch and Sundance. If however, you can just relax and enjoy the ride, then this is a fun little film. My advice: Give "Butch And Sundance, The Early Days" a shot-- If it don't thrill you, at least it won't kill you !